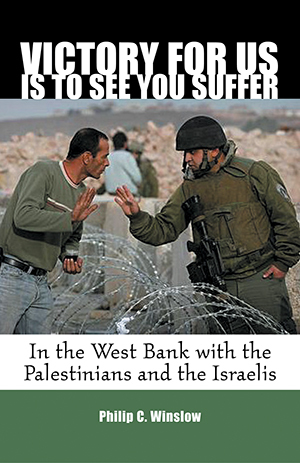 During the second Palestinian intifada, Philip C. Winslow worked in the West Bank with the United Nations Relief and Works Agency (UNRWA), driving up to 600 miles a week between almost every Palestinian town, village, and refugee camp and every Israeli checkpoint in the occupied territory. He returned just before the onset of the 2006 war between Israel and Hizbollah in Lebanon. In this important new book Winslow captures the human aspects of the conflict during the years of suicide bombings and Israeli reprisals in the West Bank-the daily struggles, desperation, and anger of Palestinian farmers and teachers, the hostility of extremist settlers, the complex range of responses from Israeli soldiers, officials, and peace activists, and even the breathtaking beauty of nature in this embattled place. On this small patch of land, broken up by hundreds of heavily guarded roadblocks, nervous young Israeli soldiers who believe they are fighting terrorists tightly control the movement of Palestinians trying to make a life on their own land. A group of Israeli women, seeking to protect the rights of those same Palestinians and protest the decades of occupation, keeps a watchful eye on the checkpoints run by the Israel Defense Forces (IDF). The Israeli soldiers are often fierce in their treatment of Palestinians, as revealed in an army video described here in detail, but some have exhibited extraordinary courage in defying the culture of cruelty and even their superior officers in order to act humanely. Former soldiers who oppose the occupation spoke candidly to Winslow about what they and their units did during their service. Working with UNRWA, Winslow negotiated the delivery of humanitarian aid through military barriers, often finding himself the target of anger from both Palestinians and Israelis. He returned to the West Bank as a journalist, in the wake of the Hamas victory in Palestinian parliamentary elections, to interview people on both sides of the checkpoints and look at the decades-long destructive cycle through their eyes. From these unique multiple perspectives Winslow offers an uncensored view of the realities on the ground that have made a just political solution and enduring peace so difficult. Listen to Philip Winslow's interview with Terry Gross on Fresh Air (November 19, 2007). Listen to Philip Winslow's interview with Lisa Mullins on PRI's The World.